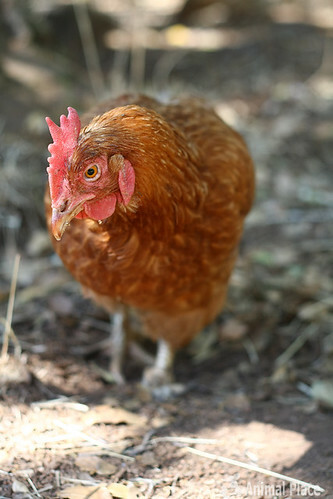 Did you know the modern hen bred for egg production lays five times more eggs than non production birds? That's nearly 300 eggs a year. When I am told veganism is "extreme", I want them to meet Sunny. And I would like for them to explain to me how artificially selecting for a trait that stunts growth and dramatically increases the risk of death by cancer is not extreme. Really, if you think about it, all the things we want in animals raised for food production are exaggerated, extreme expressions of growth. We've normalized it, because we want to eat animals, their milk, and their eggs. Sunny only has one foot, by the way. The egg farm she is from used plastic leg bands on the chicks when they arrived. They never took them off, and the bands became embedded in the hens' legs. All have scars and damage from this, but some were even less fortunate in that their entire foot fell off. Despite that, Sunny is the sweetest hen on earth. She is the first to greet you in the barn, and the last to say goodbye.